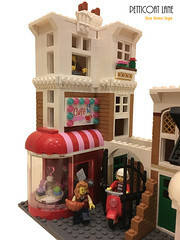 I really enjoyed building this MOC….maybe because the idea came from nowhere really! For one of my birthdays Mr. Eanair gifted me #4439 – Heavy Lift Helicopter, but helicopters aren’t really my thing and to be honest, I didn’t really have any need for in my layout. So I started playing with the Lego, and liked how the curved bricks could be used to form a roof. How this looked sparked an idea and from there The Orangery was born. This was such a organic build. 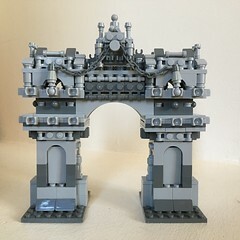 Very little thought went into planning it, and it just seemed to flow by using the bricks I had on hand, which meant I only needed to Bricklink some extra decorated arches, gold cones and tan plates. I wanted the building to resemble a Victorian orangery or sunroom with lots of ornate trimmings (brick no. 4288245 – Decorated Arch – went a long way in helping to achieve this look). 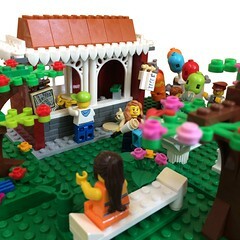 Originally I had planned for it to be a summerhouse/gazebo type thing for the park in my layout but in the end it became the coolest bar in my Lego town – frequented by Lego VIP’s. Jack Raines is there (regaling Mary Jane Watson with tales of fighting mummy armies), Santa Clause, King Hipster, Hollywood Starlet, the latest Lego Ice Dancing Champion…you get the idea. In fact the Orangery is so cool there’s always a paparazzi hanging around outside! The top part of the roof comes off to allow access to the interior, but the space is very limited and it was a complete nightmare to get pictures but I hope these give an idea of some of the interior elements. I loved building this, and am really happy with how it turned out. 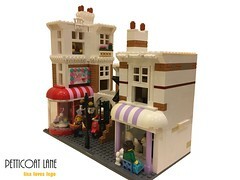 Eventually I intend to add it to the park area of my Lego town layout.